Equine transport businesses are responsible for safely shipping horses from one location to another. An entry level business can be started with just a single truck, trailer, and driver. This is a great solo business opportunity for an individual with solid horse skills and the ability to travel extensively. The first step when establishing your equine transportation business is to determine whether you will operate as a sole proprietorship, limited liability company (LLC), corporation, or partnership. There are tax and liability advantages associated with each type of business, so you should consult an advisor to see what will work best for your business. You will also need to look into acquiring permits, licenses, special liability insurance policies, or any other documentation required by city, state, or local regulatory agencies. The next step is to decide whether you will offer transportation on a local, state, or national scale. Large-scale operators with many drivers often choose to offer national service, but smaller operators may choose to focus on a local area or a particular range consisting of a few hundred miles. You also want to be sure your base of operations is in an area where there is a high concentration of potential horse industry clients. Equine transporters can focus on shipping horses for racing, showing, sales, or breeding purposes. It is likely that those interested in starting an equine transport business will already own a truck, a trailer, or both. A new vehicle or trailer can be a significant expense for those without such equipment, but a reliable vehicle is critical for success in this business. Trailers can range from a simple 2-horse gooseneck to a large tractor-trailer that will accommodate a larger number of passengers. Equine transporters should have a standard contract that the horse owner must sign before a horse is shipped. It is advisable to have an attorney draw up your contract. You should also try to obtain other transport provider contracts from competitors to see what specific areas should be addressed. Contracts usually outline terms of service in great detail (including pickup and drop off locations, total distance to be traveled, the cost of transportation, and any liability or insurance concerns). Owners are also required to provide documentation that horses are up to date on all necessary vaccinations and tests (including a current Coggins test to allow interstate travel). 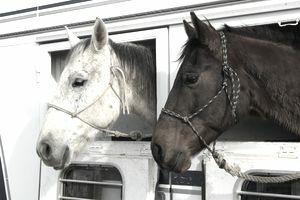 Most equine transportation services base their fees on the distance traveled, the cost of fuel, the amount of space the horse will require (for instance, some owners prefer that their horses travel in a larger box stall rather than in a standard stall), and the number of horses being shipped. It is wise to find out what other companies are charging for similar services, particularly in your local area. You need to be priced competitively within your market to attract and retain new customers. If there are many transportation companies in your area, you may want to identify and target a particular niche market (such as racing or show transportation) to build an initial customer base. Your vehicle and trailer should feature the contact information for your equine transport service and its logo. Magnets or professionally applied permanent lettering can be used for customization. Your truck and trailer act as a moving advertisement for your services and will be visible to potential customers when it is on the road or parked at shows, sales, and farms. You should also create a business card and service flyer to post at horse shows, race tracks, and other high traffic areas where those who might require transportation services will have a chance to see it. Riding instructors, racehorse trainers, farriers, and bloodstock agents may also be willing to refer clients to you, so it is important to reach out to as many equine professionals as possible when establishing your business. You should also consider placing ads in local publications, equine magazines, the yellow pages, on major equine websites, or on Craigslist. Print ads in show, racetrack or sales programs can also be a good source for prospects. A schedule should be created and maintained to ensure that all shipping contracts are completed on time. It is wise to have your appointments accessible from a smartphone through an app or scheduling feature so you will be able to review your upcoming plans while traveling. You should also have a cell phone dedicated to your business and use that number for client interactions, as you will be spending a significant amount of time on the road.